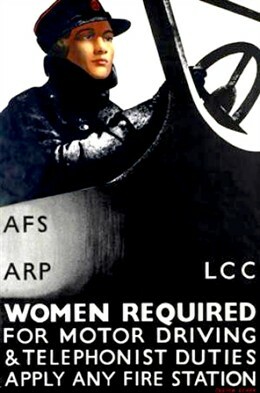 The war years allowed you [women] to express yourself because you were doing the same sort of jobs as the fellows [men]. You were allowed to express your feelings. Before that, you didn’t really. You were just a woman. First of all you were “daughter of…”, then you were “wife of…”, then you were “mother of.” But there I was Dorris Terry 2004782. Never forget your number! And so when the war was over we expected of course that when we’d come home we would still have that sort of position. But of course the government and everybody, they assumed we would slide back into the old way. It was terribly difficult because it wasn’t only us that changed. Of course, the fellows [men] that went away were not the men that came back. They’d made, seen, done, you know, awful things. My son was around 3 when his dad came back; he hadn’t ever seen him although I showed him his dad’s photos and said “This is Daddy” and “Say goodnight Daddy” and things like that. But when my son had had all my attention, especially since he was only 4 pound when he was born which was extremely little then…and my husband Michael still expected all my attention so it caused a lot of friction.